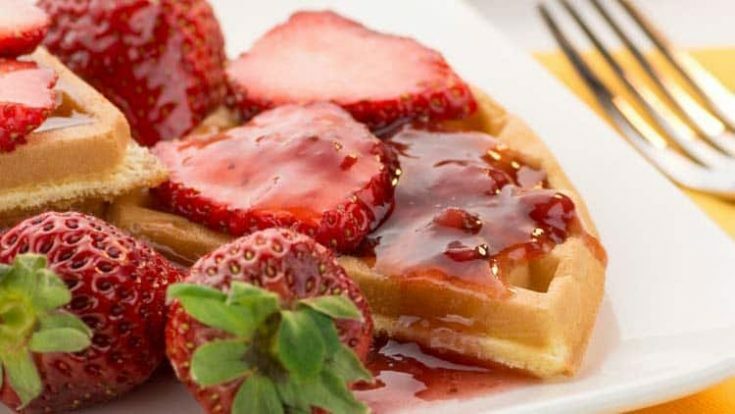 These Almond Poppy Seed Waffles with Very Berry Syrup taste melt-in-your-mouth fabulous and are super fast to make, thanks to the waffle mix I made earlier in the week. Fast and easy breakfasts are the best when you’re in a crunch getting kids out the door to school in the morning. At the same time, there is nothing quite like a hot breakfast! I whipped these waffles up this weekend and paired them with Oven-Fried Bacon. Would you believe that even after I was done cooking breakfast I still had it in me to create a fantastic Carrot Cake with Cream Cheese Frosting? Yeah… I took a break in there and made an easy dinner. Well, actually I made the cake while telling my husband how to make the Easy Enchilada Casserole that our kids devoured earlier in the week while he was away on business. Whisk together wet ingredients and then stir dry waffle mix into the wet ingredients. When they are mixed together smoothly, add poppy seeds. Heat waffle iron and cook per waffle iron instructions. What a wonderful start to any day! I wish I could make waffles ( I don’t own a waffle machine), these sound lovely. Thanks for linking up to Sweet and Savoury Sunday, stop by and link up again. Have a great day!! This sounds so good! Definitely want to try. Thanks for sharing at Merry Monday, hope to see you again tonight! Delicious thank for sharing with Hearth and soul blog hop. Oh, I love anything almond and poppy seed so I know that these will be a big hit for me! Thanks for sharing with SYC.